Hello everybody! After a little delay, I’m back this week with the second Origins article in my three-part mini-series, where I share with you my story and some of the lessons I’ve learned along the way. In the first part, I talked about how I got started and my early years in the game. If you missed the first part of this article series, you can check it out by clicking here. Today I’m going to pick up where I left off with the discovery of online Yu-Gi-Oh and how it played a key roll in developing me into the player I am today. I last left off talking about my discovery of the Yu-Gi-Oh online community. This was through a website called Yu-Gi-Oh ETC Forums. I’m sure most people reading this have had at least some experience with one forum or another, whether it be Pojo, Duelistgroundz, Yugiohforums, or another, but I enjoyed the niche community much the same that you enjoy(ed) whatever forum you’ve been a part of. I posted decks, commented on others, kept up-to-date on new releases, made friends, and just generally tried to improve my game. I spent an extended amount of time on ETC trying to prove that I was better than I really was. I wanted nothing more than to be better than members like Rice, Black Hayato, Achilles, Ryan the Legendary Duelist, Steve, Bobby, and Apollo. This led me to download the DuelingNetwork of the day, YVD. I joined team after team, trying to claw my way up and prove myself. Team Omerta, Team Enigma, and Heartless were some of the main teams I bounced between. I started several of my own teams such as Modern Empire and the new york company with many of the same friends from the other teams. It became customary to set up different teams with the same groups of friends. Everyone did it. Why? Simply Clutch; the best team in ETC’s history. They had a 20-0 record against other teams. I warred often and learned a lot. Eventually I determined that I had learned enough and was deserving of a spot on Simply Clutch. I was turned down when I asked to join. To say the least, I was entitled. My entire life my mom had been well off, which translated into getting pretty much whatever I wanted. This was my first experience with being told no. I hated it. If I wasn’t allowed to join them, I swore I would beat them. This manifested itself in the creation of many different teams, as I would lose motivation to contribute if our team suffered a single loss. I didn’t see a point after a loss, as even one defeat meant that it would be impossible to have a better record than Simply Clutch. I don’t think this was an active decision at the time, but it was probably the underlying motivator behind getting so involved and doing so on so many different teams. I eventually heard of Duelistgroundz, a forum similar to ETC, but geared more toward competitive players. Frustrated at not being able to join the team I wanted and the attitudes toward improvement of most of the people who weren’t already on Clutch, I joined DGZ and switched my focus to their warring section. When I signed up for Duelistgroundz, I joined a team with a few friends I knew from ETC, but I didn’t stay there long. We were warring against Undisputed, one of the two best teams at the time. I played against a reputable player, Tyrome Cox. I lost the match, but Tyrome said he was impressed with how I played and offered to talk to Victor Nolen, the team captain, about potentially offering me a spot on the team. Sure enough, Vic approached me soon after. I instantly accepted, as it had been what I wanted and told I could not have, a spot on the best team. I loved being on the team and everyone was better than I was, so I learned a lot by being around all of them. Being on Undisputed gave me recognition as one of the top players on the site, even though at that time I had not done anything to earn it, to be completely honest. This status allowed me to bounce around to other top teams over the next couple of years, whenever Undisputed would become inactive. The other team that I was a part of, perhaps for an even longer amount of time than Undisputed, was Starless, the original Brady Bunch team. Brady’s group of teams had players like Matt Hoey, Nate Kral, Bodan Temnyk, Josh Graham, Jonathan Weigle, Mike Steinman, Austin Kulman, and Chris Hentz. We spent many late nights in AIM chats goofing off and having fun. I learned a ton about the game and made a lot of good friends during this time, but what was perhaps the most motivating, was Christian Centeno. His online name was Soul. Ironic, because I’m not sure he had one. Chris’ favorite pastime was to tell me that I was not good enough, day-in and day-out. Chris was one of the original members of Starless and one of Brady’s closest friends. He wasn’t going to be leaving Starless and I still very much wanted to be apart of it, but even if we were both on it, Chris never considered me his teammate. It was the second time that I had been told I wasn’t good enough; first with Simply Clutch and now with Soul. Much the same way I wanted to prove myself to Simply Clutch, I wanted to prove that I was good enough to Chris. I desperately wanted to tell him that he was wrong about me, but at the end of the day, he was still a better player than I was. I knew it and he knew it, and he took the time to remind me of it every chance he got. He wouldn’t stop with just the game and he would also attack my character, appearance, and ideas at every turn. I knew the only way to shut him up was to become undeniably better than him. His constant attacks went on for two years. All of 2008 and 2009 he spent telling me how I was not good enough. At this point, I was not yet traveling to events consistently, but would go to an event whenever it was close. When Shonen Jump Nashville was announced for February of 2010, I jumped on it as an opportunity to prove to Chris that I was good enough. Meechie and I made the trip to Nashville and I felt ready. I knew that if I could top, he’d have no choice but to consider me good enough. Ten rounds of swiss and almost 800 competitors later; I broke the barrier and made it to the top cut! 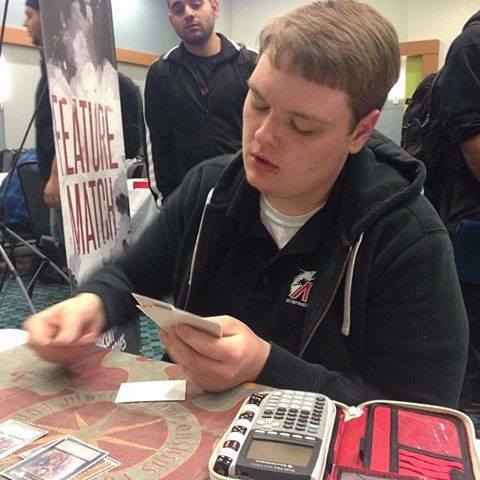 The following day I would face off against Starless teammate, Matt Hoey, in Top 16. I continued on until the Top 4, where Satoshi Kato defeated me. I just knew that Chris would not have a leg to stand on and that he’d surely have to accept me! This wasn’t the case, however. Chris didn’t travel to events and only played on YVD. It wasn’t as if I was better than him before I topped or that somehow topping one event made me better than him. He had no trouble pointing this out and continued to reject that I was good enough. I hated it even more than I hated being rejected by Simply Clutch or Chris the first time. I felt like I had proved myself and me topping was unequivocal proof that I was in fact good enough. His continued rejection proved to be even more motivating. It drove me to improve to the point that I made Top 8 at the National Championship and Top 16 at YCS Indianapolis that same year. I really appreciate my online years, as they were without a doubt my biggest motivating factor toward becoming the player I am today. I made a lot of great friends and had a lot of fun trying to prove that I was better than I really was. I still talk to many of these people. In fact, I just exchanged a few emails with Aayush (Achilles from ETC), one of the original members of Simply Clutch. This was not the end to my story of becoming the player and person I am today. In fact, this was merely the beginning, as I did not top a major event for the two years following the Indianapolis top. Be sure to check back next week for the continuation of this story and see what it took to really break through and get to where I am today. I think what I have to say will surprise a lot of people and you’ll learn something about me that most people currently don’t know. In the mean time, I hope to see you all this coming weekend in Richmond, Virginia for the ARG Circuit Series! Until next time, play hard or go home! The Scoop: With Eugen Heidt! Interesting. Of course, there are a lot of online arrogants out there, but for me, being opposed in a disrespectful manner is just another motivation.